As a Team GB snowboarder Aimee Fuller usually lives in a world of half-pipes, salopettes and backside 360s. But last weekend she put herself through a very different sporting challenge in one of the world's most secretive countries. The two-time Winter Olympian ran her first ever marathon - in North Korea. "Every single international runner I met was buzzing to be there," Aimee tells Radio 1 Newsbeat. "It was such a unique opportunity and a magical experience, it certainly opened my eyes." The Pyongyang Marathon first started in 1981, but has only been open to amateur runners from overseas for the last five years. Aimee and former freestyle skier Mirjam Jaeger from Switzerland ran the race as part of a documentary for the Olympic Channel. Preparing for the big race was not as easy as it might have been at home. The runners' every move was monitored by government officials. "I wanted to go on a training run a few days before the marathon. 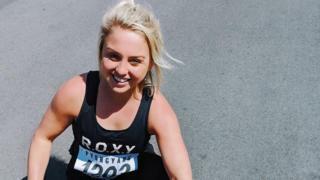 It was a four-mile jog from my hotel but I was followed in a car throughout the whole thing," 27-year-old Aimee says. It's not just constant surveillance that Aimee and her fellow runners had to contend with in Pyongyang. "Communication with the outside world is essentially impossible and having basically no connection to anyone was really surreal. "But at the same time it was refreshing - I don't think I've ever had that much time completely offline before. "It really brought us all together and made the whole thing feel very real." Around 950 international runners took part in the Pyongyang race last weekend, almost twice as many than in 2018. Aimee says race day itself was equally surreal as the days leading up to it. "Setting off, there were thousands of people inside the stadium. They had been queuing to get in for hours, it genuinely felt like the Olympics opening ceremony. "Then as you head outside, for the first six-and-a-half miles the streets were lined with people clapping and cheering. "It felt like the locals were proud to be showcasing the beauty of their city. It really felt like an international event. "Then the streets became more sparse, the scenery is beautiful, but it was also barren, basically a long straight road and quite lonely at times." So what music helped Aimee through the marathon course? "There are obviously no streaming services in North Korea, so I ran the whole 26.2 miles with the same Annie Mac podcast on repeat," she says. President Kim Jong Un's strict rule over his people has been widely condemned on the international scene, with many countries imposing sanctions over North Korea. But Aimee says she wasn't worried about being seen to legitimise the government by taking part in the marathon. "I think the whole point in this trip was to really showcase the power of sport and how it can try and bring people together. "It really did feel that, on the day, the race helped unite different people. "It brought people together and felt like it was unifying a very isolated country." North Koreans are known to be reserved people, who are cautious speaking to strangers but Aimee insists she did make friends with some of the locals during her marathon experience. "I actually had dinner with the winner of the women's marathon race. She was North Korean, we had a translator and that was a very interesting experience. It certainly opened my eyes." Aimee is also running the London Marathon at the end of April with her mum, but is expecting a very different atmosphere to the North Korean capital. "There were hardly any water stops in Pyongyang, very little food and certainly no-one handing out jelly babies, which you apparently get in London." But did her experience over the last 10 days make Aimee want to repeat her North Korean adventure next year? Aimee pauses before saying: "I don't know if I'd rush back." "I missed having my coffee out there, and simple things like waking up and putting the radio on. "I'd love to go back and showcase my own sport of snowboarding there. I feel there's a real opportunity there to share knowledge with them." At the end of her first visit to the country, Aimee says the isolation she felt was one of the most striking things she'll take away from her time in North Korea. "I love being connected with social media and the power and opportunities it can create, but to be 'off-grid' for a whole eight days was something special. "There are very few places in 2019 where you can be completely disconnected to the outside world."